This post contains affiliate links which means that if you purchase an item, I may receive a small commission at no extra cost to you. All opinions are as always, my own. And finally, friends, — you can’t have a party without dessert… Since we’re celebrating the Super Bowl, I’ve gone with a Super-Sized Cookie! One that is non-denominational in terms of teams or regions. A classic with a few twists. A cookie for the masses. I give you Dark Chocolate Cherry Ripples! BAM!!! These beauties have it all… Deep, bittersweet chocolate, sliced almonds for a little crunch and bits of puckery-sweet, dried cherries. Incidentally, when I say bittersweet chocolate, I mean deep dark – not from chips, but instead from two 70% cocoa bars. I was inspired to make these cookies after reading (and salivating) over Sarah Kieffer’s, The Vanilla Bean Baking Book. Sarah has compiled the most drool-worthy cakes, pastries and ice creams in her tome… and then there are the cookies. Her chocolate chip cookies, in particular. 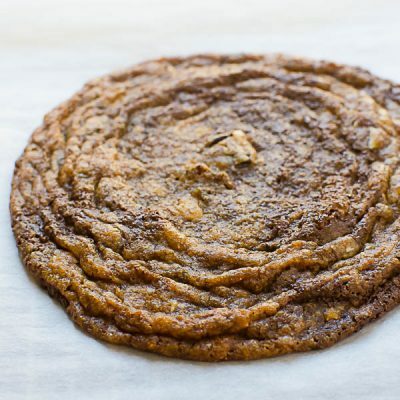 She uses an unusual method for getting those gorgeous ridges and ripples – one that defies all I know about cookie baking. I read the instructions first with a puzzled look and a shake of the head, second with an “I wonder if that works” and finally, I resolved “to see if that works.” I admit, it was the look of these cookies that had me so enthralled — if they had been like any other chocolate chipper, I probably would have passed them up, but now I’ve hopelessly succumb. Because I can never-ever leave well-enough alone… I did add my own spin to her recipe… My twist included using half all-purpose and half whole wheat flour, adding more brown sugar and less white sugar and adding chopped dried cherries and sliced almonds to the dough. I also increased the salt slightly and used a really dark chocolate. The key to Sarah’s method and to achieving this signature look are threefold: First making a larger than normal sized ball of dough– about 1/3 cup of dough per cookie. 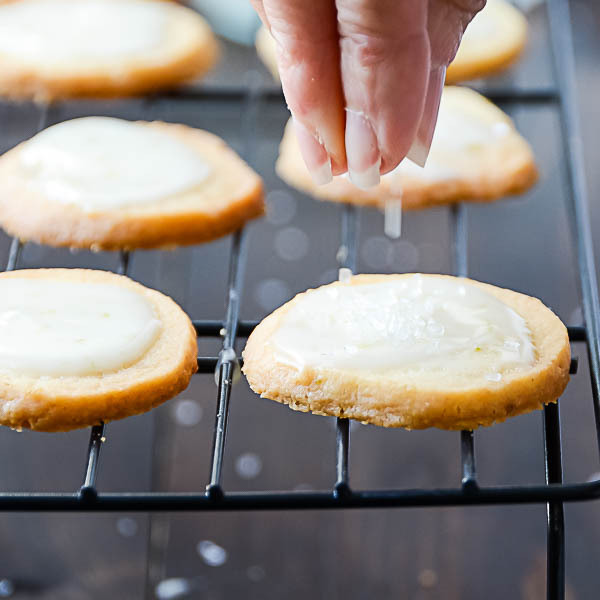 Second, freezing the dough on the cookie sheet for about 15 minutes before popping it into the hot oven and third — slamming the baking pan down about 8 times while the cookies are baking to deflate the dough and send a wave-pool of action across the cookie. Needless to say, this is a more involved process than your average chocolate chipper — and it’s completely worth it. These cookies are super-thin with crispy edges and a chewy interior. The satiating dark chocolate is a delicious complement to the bits of sweet-tart cherry. Sliced almonds provide a nutty crunch. But it’s the size and look of the cookies that makes you do a double-take. Each one is about 4″-4 1/2″ in diameter, yet they’re ridiculously thin. For kicks, I decided to dole out the last of my dough the way that I normally would – by rounded teaspoonfuls. No freezing, no slamming. The result (above) is what I got. They tasted fantastic, but they lacked that visual wow-factor… The big ones, however, were perfect – and are ideal for celebrating the big game, don’t you think? Get your own copy of this gorgeous book and see what all the fuss is about! Chocolate Chip Cookie Recipe like you've never had... Made with dark chocolate bars, dried cherries and almonds in ginormous cookie form! Preheat the oven to 350°. Line two baking sheets (that will fit in your freezer) with parchment paper or the non-shiny side of tin foil. Set aside. In a small bowl combine the a.p. flour, whole wheat flour, salt and baking soda. Whisk to combine and set aside. In the bowl of a stand mixer, combine the butter, sugar, and brown sugar. Cream the butter and sugars until smooth. Add the egg vanilla and water and beat to incorporate, scraping the bowl down occasionally. Add the flour mixture to the butter and beat on low speed until just mixed. Add the dark chocolate, dried cherries and almonds and mix on low speed to combine. Scoop out 1/3 cup of dough and roll it into a ball. Place on the cookie sheet. Space the balls far enough apart so they don't touch when they spread ... about 4 inches. Place the cookie sheet in the freezer for 15 minutes. Transfer the cold cookie sheet to the oven and bake for 10 minutes. Lift one side of the cookie sheet up about 4 inches and drop it down. Repeat. Cook for two minutes and repeat the process of lifting and dropping every two minutes until the cookies are crispy on the edges and not quite done in the middle, about 6-8 minutes longer. Remove from the oven and let the cookies cool for a few minutes on the baking sheet, then transfer to a wire rack to cool completely. Repeat the process with each batch of cookies. I never realized that the wave pattern came from slamming down the pan. Since you mentioned it, it makes total sense, but I had never put it together! As usual, this recipe appeals to me with all of my favorite flavors – especially the dark chocolate and the cherries! I’m in heaven and can’t wait to try these! I had to read her recipe a few times to “get it”, but I’ll be darned if it didn’t work brilliantly! Are these cookies huge or what?? I am obsessed with all of that chopped up chocolate! They are about 4 1/2″ across – so that’s pretty huge in my book! The dark chocolate is fabulous in them! Oh. My Gosh. You are speaking to my heart with this one! I love big, gourmet bakery style cookies such as these. They look so buttery and the combination of cherry with dark chocolate? Heavenly. Thanks, Amanda — they’re a little more effort than your standard cookie, but then — THESE AREN’T YOUR STANDARD COOKIE! Yes, these were definitely a hit! And the cherry adds a nice tartness! Let me know how it works out for you, Katrina – and glad you like the name… Ripples are the perfect adjective, right? We polished off the last of them last night!! So very good! How yummy! Love the flavors that you added, and dark chocolate is my favorite! This is so interesting. I have never heard of this method before. And I wonder how she ever thought to do this in the first place. But the results are clear – it works. Wow! I totally want to try this next time I make cookies (I just made cookies last night…if only I had seen this one day sooner!). Love the flavors here too! I don’t know how she came up with it, but the results are impressive. I have Sarah’s lovely cookbook and the ripple cookies never fail to capture my attention. They are just so unusual and so much fun. I’m loving your spin on them. I mean. . .you can never go wrong with a tasty treat chock full of cherries. I know – that photo just kept me coming back again and again! I love flat spread out cookies like this.. especially when they are big!! Love those ripples. OMG those gorgeous ripples are calling my name!! The ripples are what kept me coming back, too, Sue! It’s hard to find a unique chocolate chip cookie recipe these days, but this is seriously blowing my mind! Those ripples not only look incredible, but I bet they add to the texture, too. 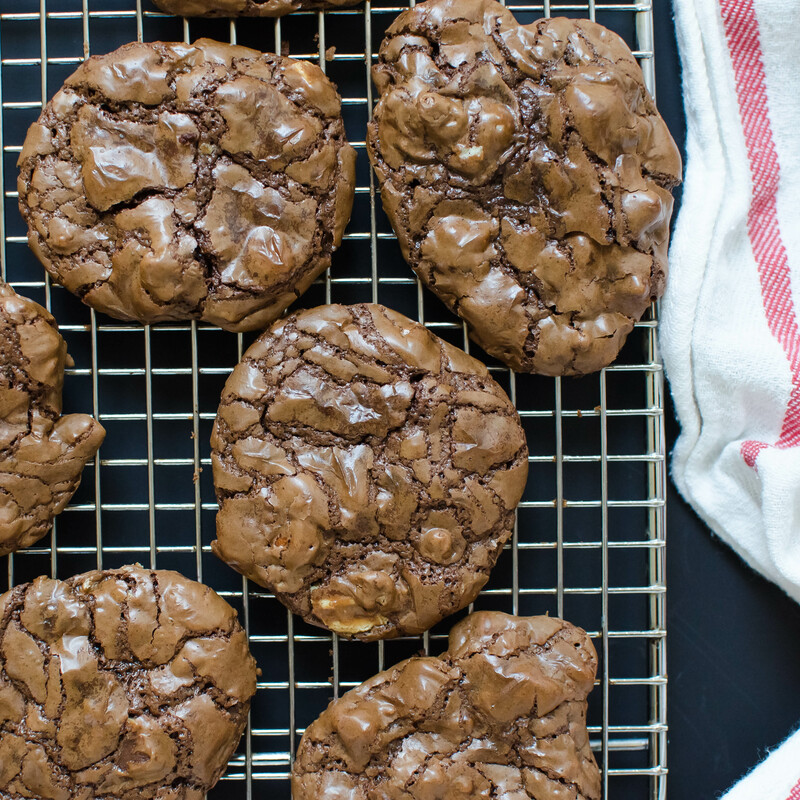 Crisp edges and chewy centers are my absolutely favorite kind of cookie. Dark chocolate, cherries, almonds… and extra salt? Yes yes yes yes yes. I’m pinning these for the next time a cookie craving hits. I felt the same way, which was why I HAD to make these! This with a vanilla ice cream would be perfect!! Thanks Sarah! The only fighting in this house is about who gets the last one! I love super sized cookies…of course! I try to use dark chocolate in recipes as well. What great flavors! The instructions are so interesting too! Glad you approve, Christine! The instructions baffled me at first, but the technique works!